The U.S. Attorney’s Office in Los Angeles announced a slew of federal charges, including bribery and influence peddling, against California State Sen. Ron Calderon on Friday. A Democrat serving Montebello, Calderon took about $100,000 in cash bribes plus plane trips, golf trips and gourmet meals, according to prosecutors. The alleged scheme involved working for or against certain state legislation. 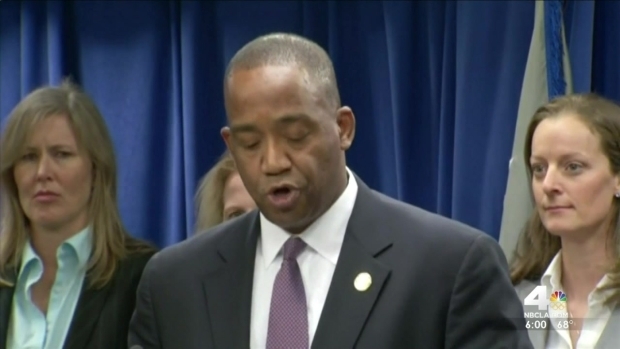 “When public officials choose to callously betray the trust of the people that they serve and selfishly line their pockets with money for the privilege of holding the office they serve," U.S. Attorney Andre Birotte said in a Friday press conference, "then it’s up to us to take the steps responsible to make sure we hold these individuals accountable." The indictment charges Calderon with mail fraud, wire fraud, honest services fraud, bribery, conspiracy to commit money laundering, money laundering and aiding in the filing of false tax returns. 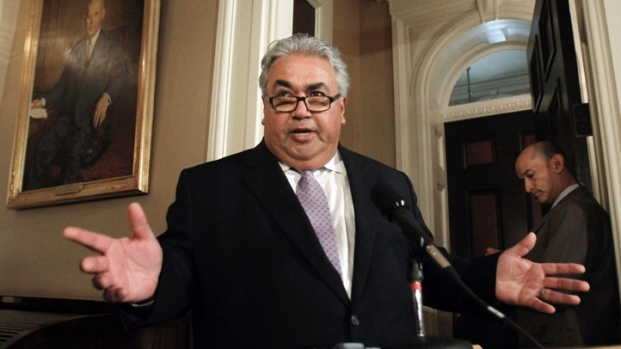 State Sen. Ron Calderon and his brother, former Assemblyman Tom Calderon, were indicted by a federal grand jury on corruption charges on Friday, including allegations the senator took more than $100,000 in cash bribes. Kim Baldonado reports from downtown LA for the NBC4 News at 5 p.m. on Friday, Feb. 21, 2014. The 56-year-old lawmaker has agreed to surrender next week, the FBI said. If convicted, Calderon faces a statutory maximum sentence of 396 years in federal prison. Tom Calderon, 59, the senator's brother, also is charged in connection with the alleged scheme. He is charged with conspiracy to commit money laundering and seven counts of money laundering for allegedly funneling bribe money through a non-profit group and consulting company he operates, prosecutors said. Tom Calderon pleaded not guilty to the charges Friday afternoon. Michael Drobot, a former hospital owner involved in the alleged corruption scandal that led to federal charges against California politicians Ron and Tom Calderon, was nowhere to be found hours after entering a plea agreement on Friday. Hetty Chang reports from Corona del Mar for the NBC4 News at 6 p.m. on Friday, Feb. 21, 2014. In the wake of the FBI raid on Ron Calderon’s office, the senator filed a complaint in Sacramento in 2013 accusing Assistant U.S. Attorney Doug Miller of involvement in “a string of illegal leaks” that date back to 2010. In another case announced by the U.S. Attorney’s office Friday, prosecutors said Drobot has agreed to plead guilty regarding a major health care fraud scheme. The charges against the hospital executive involve tens of millions of dollars in illegal kickbacks in exchange for a glut of patient referrals who received spinal surgeries. The referrals, according to prosecutors, led to more than $500 million in bills, which were fraudulently submitted and, in large part, paid by the California worker’s compensation system. Law-enforcement sources described the allegations as what could be one of the largest health care fraud cases in state history. Drobot is suspected of having had a heavy hand for some 15 years in the alleged kick-back scheme, which was financed by inflated prices on medical devices implanted in state workers’ compensation patients. The scheme exploited the spinal pass-through law, which Ron Calderon allegedly kept on the books after receiving bribes from Drobot, authorities said. Drobot was not indicted in the Calderons’ corruption case, but admitted to paying bribes to the senator, the FBI said. He is scheduled to be arraigned March 31. As part of a plea agreement, Drobot has agreed to cooperate with the government’s ongoing investigation of the health care fraud scheme, as well as the government’s prosecution of the Calderon brothers. In addition to accepting bribes from Drobot, Ron Calderon allegedly also accepted $60,000 from an undercover FBI agent posing as a film studio head, authorities said. After Calderons’ indictment was made public Friday, Assemblymember Cristina Garcia said she hopes “the days where special interests have the ability to unduly influence elected officials” are coming to a close. Ron Calderon will be arraigned Feb. 24. Tom Calderon self-surrendered Friday morning, prosecutors said, and will be arraigned Friday afternoon. Steinberg, the California Senate leader, is calling on Calderon to resign his Senate seat. 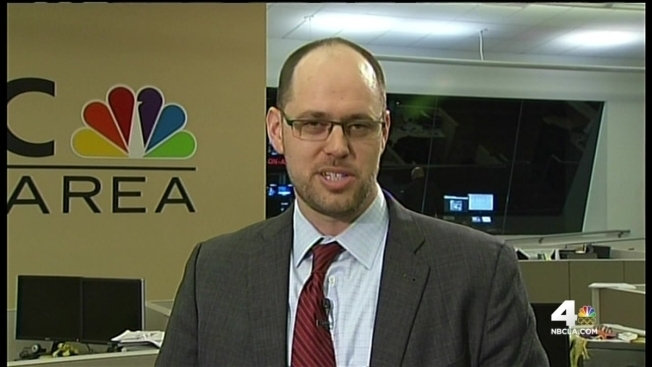 NBC News' Andrew Blankstein contributed to this report.